The whistling willows called out as the cool ocean breeze flowed through their spindly fingers and over the misty mountain. 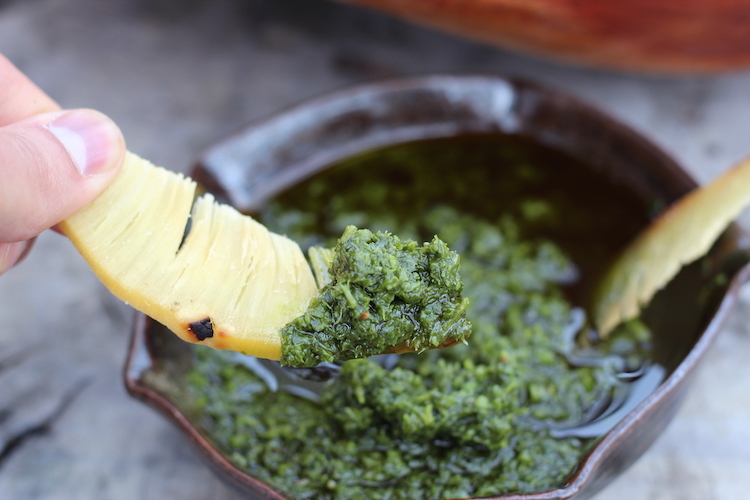 We sat quietly dipping golden breadfruit chips into ceramic bowls filled with the deep green hues of chimichurri and a scotch bonnet sauce infused with coconut oil, garlic, ginger and seasonings while hummingbirds joined us for lunch at a nearby banana flower. “Would you like more?” Lisa asked as we examined the few crumbs remaining in our shared bowls. The thought was tempting, but we graciously declined knowing that this tropical farm-to-table feast had just begun. We could have been anywhere – lost among the trees and the hills — where only the expansive blanket of hovering mist could pinpoint our location. 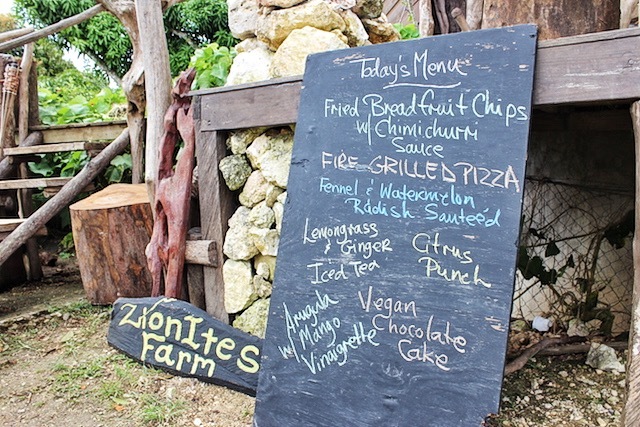 I smiled inside thinking about how serendipitous it was to have found this tiny sanctuary tucked somewhere between the buzzing tourist towns of Montego Bay and Ocho Rios. To be more precise, we were at the home of Lisa and Christopher Binns in Free Hill, a small community of approximately 300 people located in St Ann’s Parish. 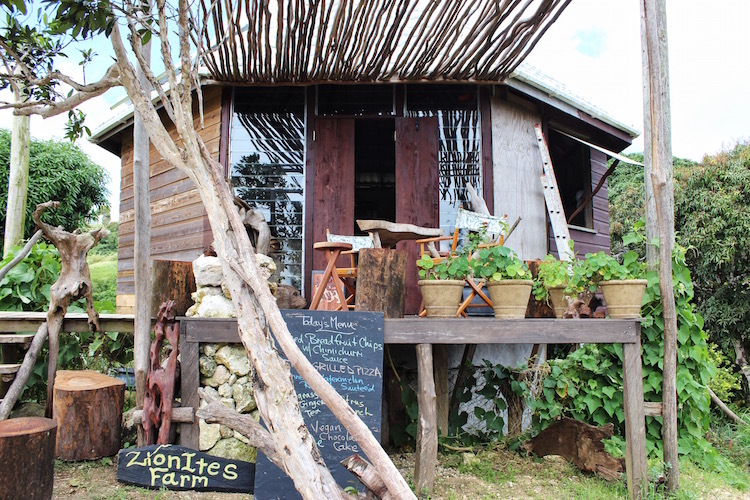 To most who visit, the couple’s home is better known as Stush in the Bush, a small tasting restaurant at Zionites Farm which prepares many of the organic vegan and vegetarian items on offer in their line of bottled products. 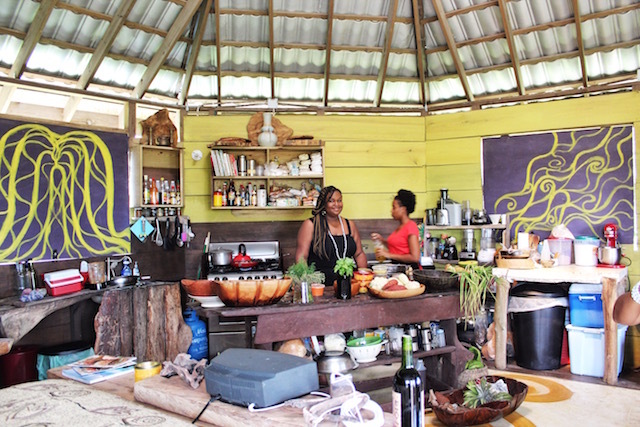 My husband and I had come to spend a day to enjoy a clean meal freshly picked from the ground and to see a side of Jamaica most travelers rarely explore. 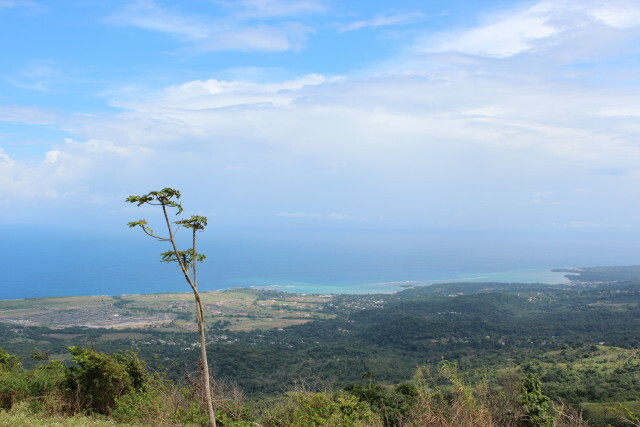 When we arrived, Christopher welcomed us into his rugged Pajero and took us to the top of Free Hill, so we could admire one of the most stunning views on the island as he pointed out several of Jamaica’s popular attractions including Dunn’s River Falls and Nine Mile, the hometown of Bob Marley. After about 10 minutes of chatting and soaking in the view, we hopped back into the Pajero and headed down a rocky dirt road to Stush in the Bush. From the outside, the rustic boho chic tasting restaurant resembles an elegant chalet that one might find at a luxury African safari lodge. Lisa welcomed us warmly and immediately made us feel at home – which was suiting being that we were actually standing in her home. 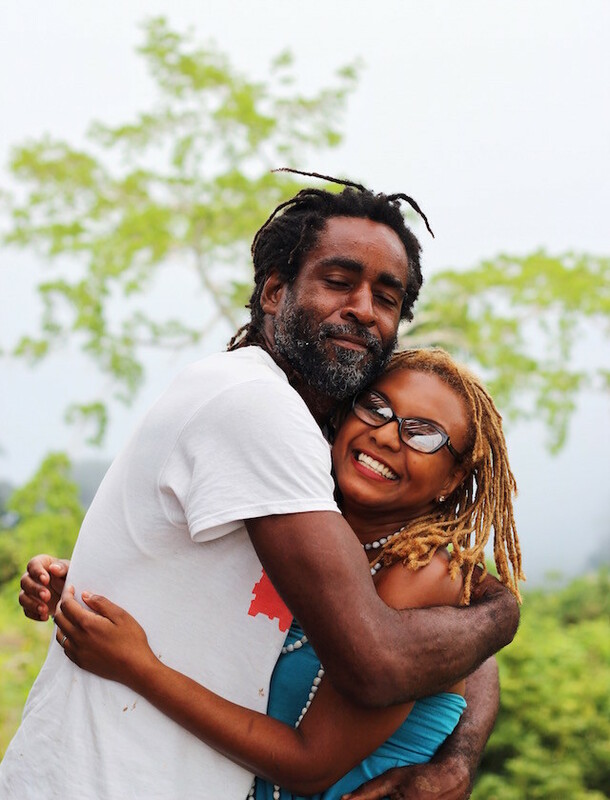 She, a Bajan who grew up in the U.S. and Christopher, born in Free Hill, and later moved to and attended university in Canada met and fell in love while Lisa was vacationing in Jamaica. The two married and Lisa relocated to Christopher’s hometown where she now spends all her time nurturing the delicious food she creates. Christopher mans their 15-acre organic farm and makes food deliveries for their line of bottled products. The small room held the Binns’ bed, a long wooden table and a full kitchen brimming with pots and pans and colorful fruits and vegetables. It was a cozy space that smelled divine and I immediately felt a rumble in my stomach. 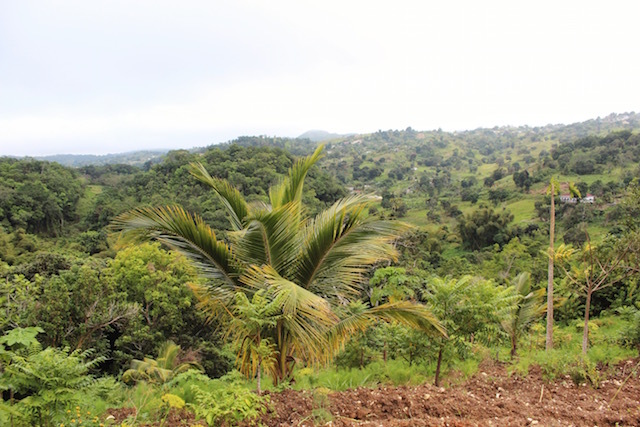 Lisa offered to seat us inside or outside (at the higher altitude – about 2,000 ft. — it can get a bit chilly by Jamaican standards), we chose outside because the scenery was much too pretty to pass up. Warm lemongrass and ginger tea accompanied an appetizer of fried breadfruit chips paired with two side dips: chimichurri and a spicy scotch bonnet sauce packed with an explosion of flavor that is only found when ingredients are picked from the ground and placed onto your plate. 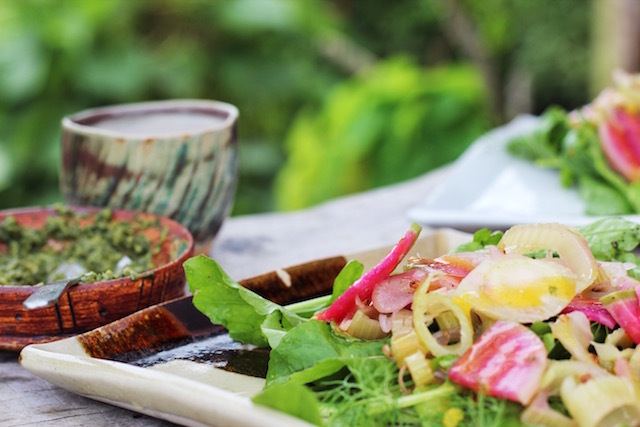 A beautifully pink and green salad mixed with watermelon radish, fennel and arugula was presented to us on small plates. It was the perfect palate cleanser — crunchy, refreshing and crisp — before heading on to the main meal. Next up was the first of two vegan fire-grilled pizzas. Lisa presented the rustic pie with smiling pride and sliced it up into hearty pieces that when pulled from the whole dripped with delicious vegan cheese and olive oil. 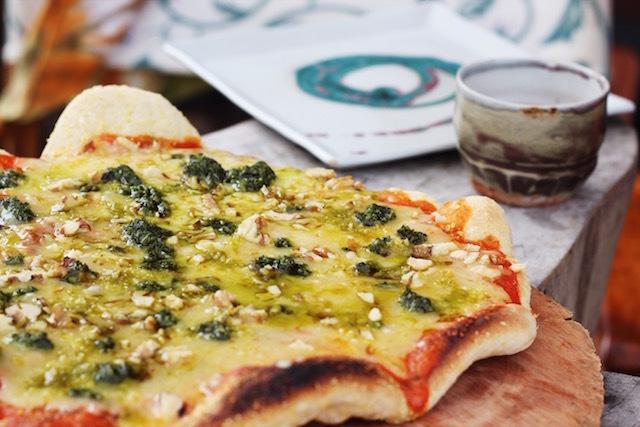 Homemade tomato sauce, basil pesto and walnut chunks sat beautifully atop a handcrafted pizza dough made with cornmeal to give each bite a bit of sweetness and crunch. The second pizza married sweet and savory with pineapple chunks, caramelized shallots, vegan cheese and Lisa’s homemade tomato sauce. Having never experimented with inventive toppings, I found the tangy pineapple to be the perfect complement to the buttery shallots. And who could even think of dessert after such a nutritious filling meal? 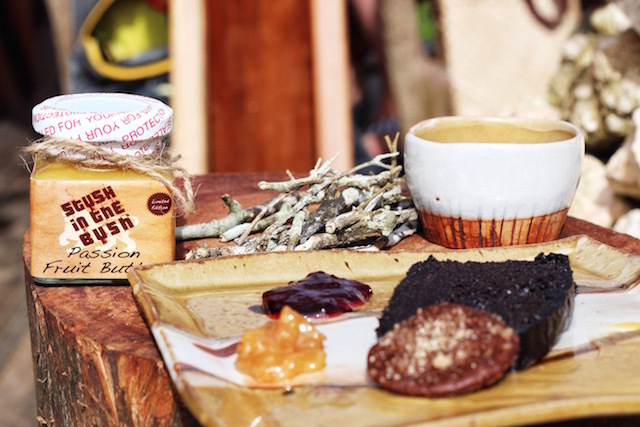 “No, there’s just no waayy…” the words falling from our lips as Lisa presented two decadent slices of vegan chocolate cake with splotches of sorrel preserve, banana preserve, a smear of passion fruit butter and a chewy ginger cookie. Not a sound was made as we dipped and dragged our cake in the small pools of preserve. We had made our sins and it was time to walk them off with a tour through the farm led by Lisa (Christopher usually guides guests through the farm, but he was off making deliveries). We made our way through “Love Lane” a carved path of sloping land enveloped by towering willows, which gave way to a variety of fruit trees including banana, mango and mulberry, and rows and rows of raised beds dotted with baby arugula, tatsoi, kale, cilantro, watermelon radish, basil, parsley, edible flowers and other herbs and vegetables Lisa uses in her delicious dishes and products. At one of the highest points on the farm rests the structure of an old greenhouse, the view is the best on the property. Its skeleton may just be the foundation for the Binns’ first guesthouse. 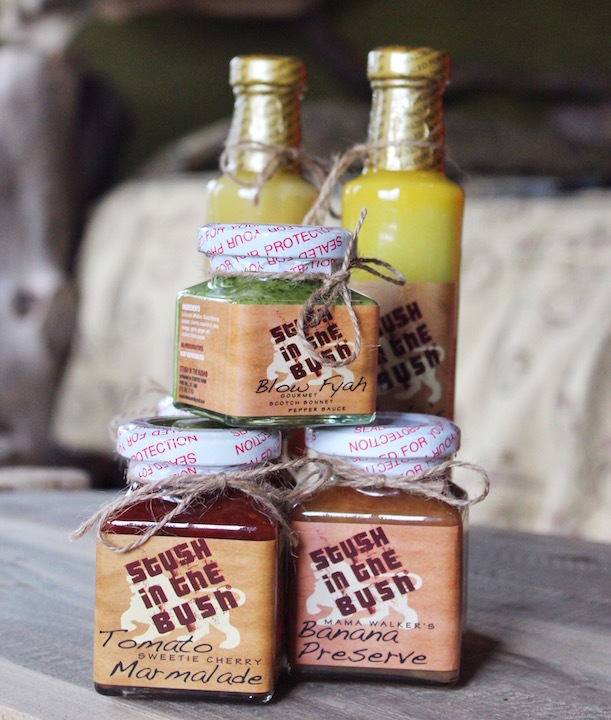 We made our way back to the restaurant to gather our things before heading to our hotel, but not before buying a few jars of Lisa’s Chimichurri Sauce, Blow Fyah (the scotch bonnet sauce we used as dip for our breadfruit chips) and Tomato Sweetie Cherry Marmalade. We thanked Lisa and Christopher (who made it back just in time to say goodbye) for a beautiful and delicious day as she handed us our bag of goodies. I couldn’t resist pulling out one of the pretty jars to examine it more closely. I scanned the label for the ingredients searching for the secret to Lisa’s incredible food. And there it was, the very first ingredient listed: “Love and affection”.